We applaud the federal government and the NOAA in their efforts to minimize damage to sea turtles and investigate the totality of the Gulf oil spill in regards to the turtles and their habitat that's been affected. Story received from the AP. "NEW ORLEANS (AP) -- Federal officials say they're stepping up plans to release sea turtles that were stranded and rescued during the Gulf oil spill and study how they've been affected. Barbara Schroeder, sea turtle coordinator for NOAA's fisheries division, said Thursday no turtles needing treatment from oil exposure have been found since early August. Two groups were released last month. 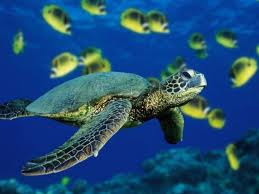 A total of 1,086 sea turtles have been collected offshore and along shorelines. Scientists have released more than 14,000 hatchlings from nests moved from the northern Gulf of Mexico to the east coast of Florida. The next step will be inspecting areas heavy with sargassum, a marine algae that draws creatures on which the turtles feed. Surveys begin in two or three weeks, followed by long-term monitoring."